TSPSC Art Teachers Recruitment Syllabus, Exam Pattern/ Scheme of Examination. 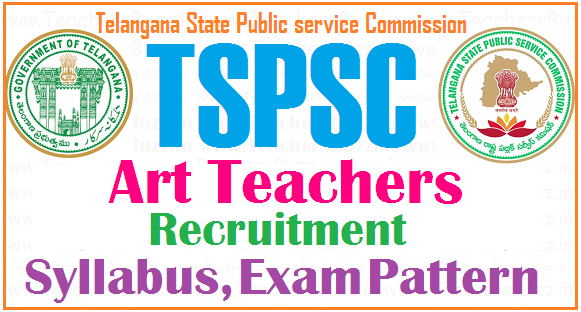 TSPSC TS Residential ArtTeachers Recruitment Syllabus, Exam Pattern/Scheme of Examination, TSPSC ArtTeachers Syllabus, Exam Pattern, TSPSC ArtTeachers recruitment syllabus,exam pattern, TSPC Gurukulams Music Teachers recruitment syllabus,exam pattern; Scheme and Syllabus for the post of Art Teachersin Residential Educational Institution Societies; Preliminary (Screening Test) Scheme and Syllabus, Main Examination Scheme and Syllabus for the post of Art Teachers. TSPSC TS Social welfare Gurukulam Art TeachersPosts Recruitment examination pattern, TSREIS(School Education), TSWREIS (Social Welfare), MJP TSBCWREIS (BC Welfare), TSTWREIS(Tribal Welfare), TSMWREIS (Minority Welfare) Art TeacherPosts Recruitment Scheme of exam. TS REIS's Art TeachersRecruitment syllabus, exam scheme, tspsc tswreis, mjp bcwreis, tstwreis,tmreis Art Teachersrecruitment syllabus, exam scheme details are given here. Paper :General Studies and Art and Art Education. Also our own famous Artists like Late Sri P.T. Reddy, Late Sri Kapu Rajaiah, Late Sri Kondapally Seshagiri Rao, Padma Sri Jagadish Mittal, Padma Sri K. Laxma Goud, Sri Thota Vaikuntam, Sri Surya Prakash. 2. Importance of Co-Curricular Activities on the Campus such as Workshops andSeminars, Conferences, Exchange Programmes, Art Competitions.